At 9,000 ft elevation and with expansive windows displaying panoramic views, this Lagoon Townhome is truly a treasure. This townhome is located in the heart of everything: it's centrally located within an easy 20-minute to several ski resorts in the winter and hiking, biking, and boating in the summer. 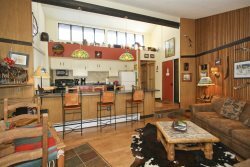 The townhouse overlooks Lake Dillon, which has the world's highest deep water marina! Soak it in! This home has three bedrooms with en suite baths, a loft off of the living space, and additional Murphy Bed in a semi-private alcove. Please note that you must climb a ladder to get to the loft; therefore children under 18 years old are not allowed in the loft. Everyone will be anxious to gather for group dinners. The kitchen, dining and living room are in an open plan which captures the beautiful views of Lake Dillon and the surrounding mountains. Master Bedroom: King bed with full en suite bathroom (shower, separate jetted tub, and dual vanity sinks) on upper main living level. Bedroom 2: Queen Bed with en suite bathroom (toilet and shower only) on upper main living level. Bedroom 3: Queen Bed with en suite bathroom (toilet, shower only) on 2nd level. Extra sleeping area: Queen Murphy Bed in semi-private alcove just outside bedroom 3 closes with curtains for privacy. Loft: 2 Full beds in the open lofted space in the great room - accessible by ladder only. NO CHILDREN UNDER 13 ALLOWED IN THE LOFT! All stays at this property shall include a cleaning fee, sales tax, and a $29 Vacation Rental Damage Protection fee. These will be included in the total on the checkout page. Communication was clear and fast. This House is beautiful and BIG. It is a convenient location close to ski resorts and shopping. Beautiful views from main dining/kitchen area too. The home is very well kept and clean.